Ever since I started serving homemade ciabatta bread to my Livingstone friends, they have urged me to teach them how to make it. Later, as I’ve posted more and more recipes on my blog, there’s also been a growing interest in the food I’m developing here on the farm, using fresh garden-to-table ingredients with wild edibles added, as and when they come into season. As I wrote to people who, over the months, have expressed interest: “My style of food does not use meat as its central focus; rather it is created around what fresh produce I have available on any given day. Meat and other forms of protein, like eggs and cheese, are added to enhance the fresh produce.” In other words it is plant-centric and, on the whole, healthy. 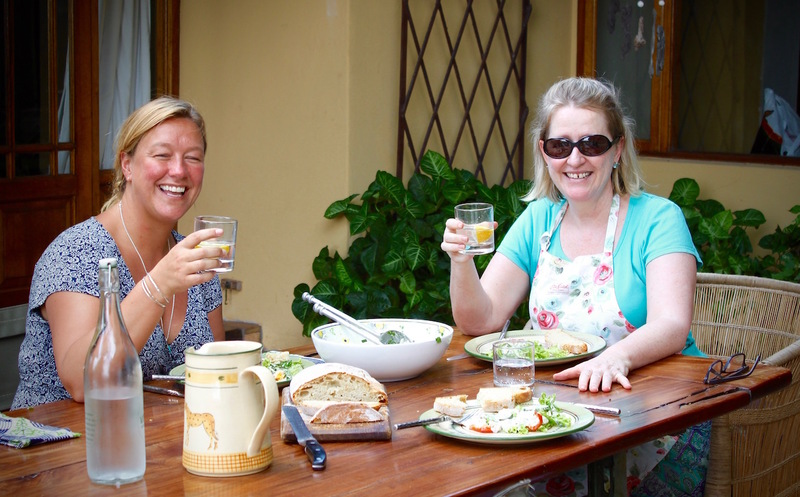 One couple in particular was determined to learn how to make the bread, but they also loved the idea of eating what they grew in their garden. Ben and Vanessa Parker live on the Zambezi River, which, with regular visits from hungry elephants, hippos and monkeys, makes growing a garden much more challenging. They had, however, recently electrified their garden fence and, as a result, were having more success with growing fresh produce. “We don’t have very much in the garden,” they both warned me, “but we would love you to come over to show us what we can do with what we have anyway.” Vanessa and I set a date for the class last Monday. She told me that her assistant, Maggie Phiri, would be joining us, as well as her friend, Honour Schram de Jong, who was visiting from England. Lesson One: making ciabatta bread. 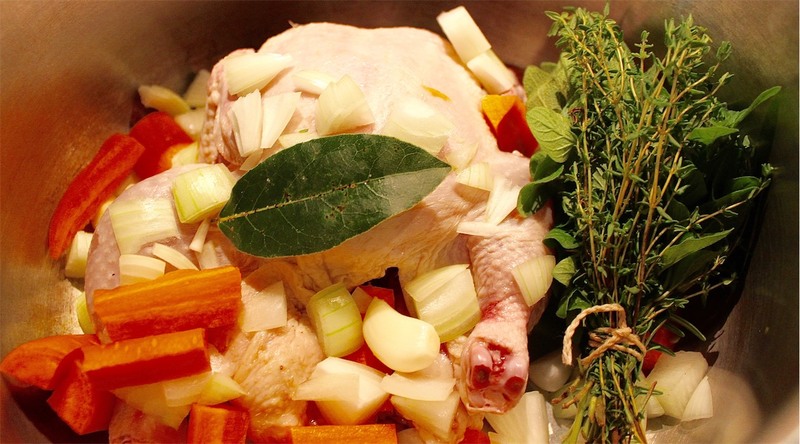 Lesson Two: making chicken stock from scratch. The core of my classes center around cooking food that is available locally. By this I mean fresh ingredients from one’s own garden or the wild, or cooking with what one can purchase in Livingstone, give or take the odd exception. The classes are set up into four sections: starters, main courses, desserts, and the in-demand ciabatta bread. Within these sections there are a few fundamental elements I feel sure cooks would do well to consider: making and freezing homemade stocks; making dressings, sauces, and five-minute mayonnaise; as well as preserving and freezing. Yet, I have also always seen these classes as a collaboration, therefore I am happy to consider requests to teach specific recipes, or to focus in on one element alone. 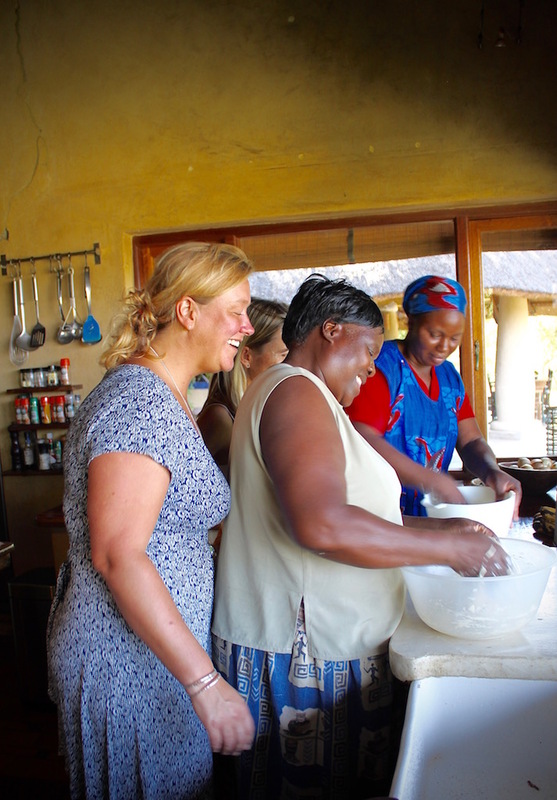 I am willing to teach people in their own kitchens, or to welcome them into mine. In addition, I am happy to show cooks and gardeners how to grow fresh herbs and vegetables that are guaranteed to elevate a dish beyond the ordinary. Because of the importance I place on fresh herbs, I give each participant a small gift pack of essential seeds to plant outside their own kitchen. Lesson Three: out of the garden, into the kitchen, and into a dish! 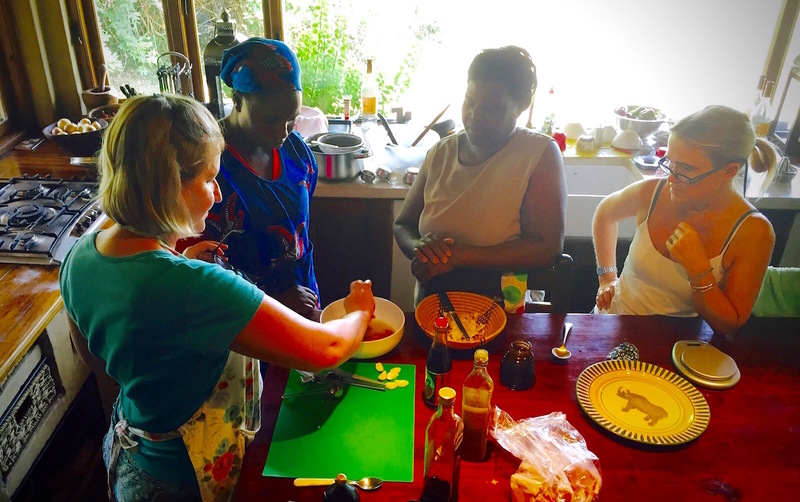 Lesson Four: making five-minute mayonnaise, later mixed with fresh lemon and basil and used in a Chicken & Mango Salad. Recipes involving spinach, including perhaps spinach soup? A chicken dish or two, maybe one that could be for a light lunch and one for supper. How to cook pork. I have a couple of packs of pork loin that I’m not to sure what to do with; I was thinking of a ginger sort of thing! Maybe a nice couscous dish or some salad sort-of dishes to have for lunches or light suppers. Al fresco lunch overlooking the Zambezi River. Photo credit: Vanessa Parker. Chicken stock in which the meat would be used in a salad, while the stock would be used in a marinade, as well as to cook the couscous. The remainder would be frozen. 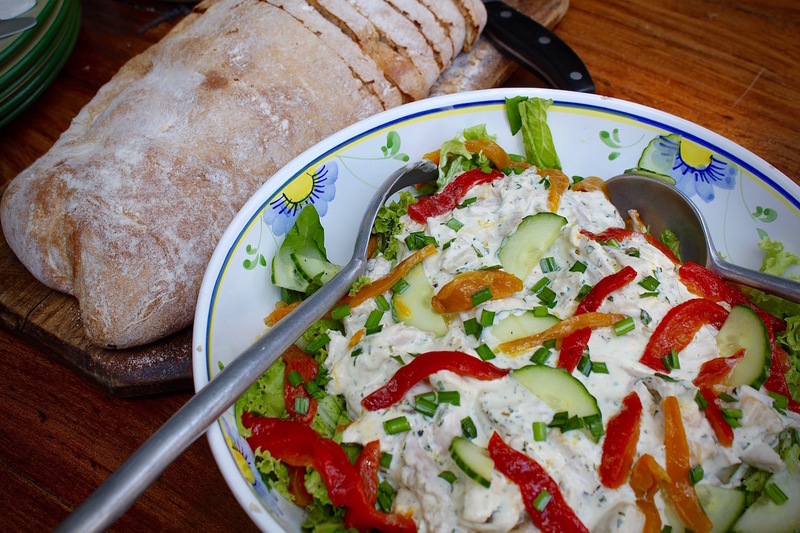 Chicken & Mango Salad with Lemon & Basil Mayonnaise. Roasted peppers in olive oil and garlic. Ginger-Soy & Sesame Pork Loin. Roasted Butternut stuffed with Jeweled Couscous. Demonstrating how to make the ginger-soy & sesame marinade for the pork loin. Photo credit: Honour Schram de Jong. Many ingredients are not always readily available in Livingstone. Shopping here is not like shopping in the West, so I checked in with Vanessa to make sure she had all we needed and offered to supplement any ingredient that was missing. I also let her know our class would kick-off with a trip to their vegetable garden to pick what was available that day. Which, despite being told to the contrary, turned out to be a substantial amount. In addition to what Vanessa had told me was growing, we found lots of sweet peppers, dill, thyme and chilis, all of which would be used later in various dishes. We worked as a team throughout the day. While my assistant, Adelina Banda, and I explained and demonstrated, each person contributed something to every dish. The highlight, I think, was the slapping of the dough for the ciabatta bread, as well as the salad we made for lunch out of the leftover chicken meat. The class lasted from 8am to 4pm, with an hour’s lunch and coffee breaks in between. Because Vanessa had asked to prepare the dishes for her dinner party, we never cooked the pork. She and Honour flash-fried it in a pan on the stovetop just before dinner. They also garnished Ottolenghi’s Green Gazpacho and the Gluten-free Mango Cheesecake and, as you can see in the pictures below, they did a fine job! 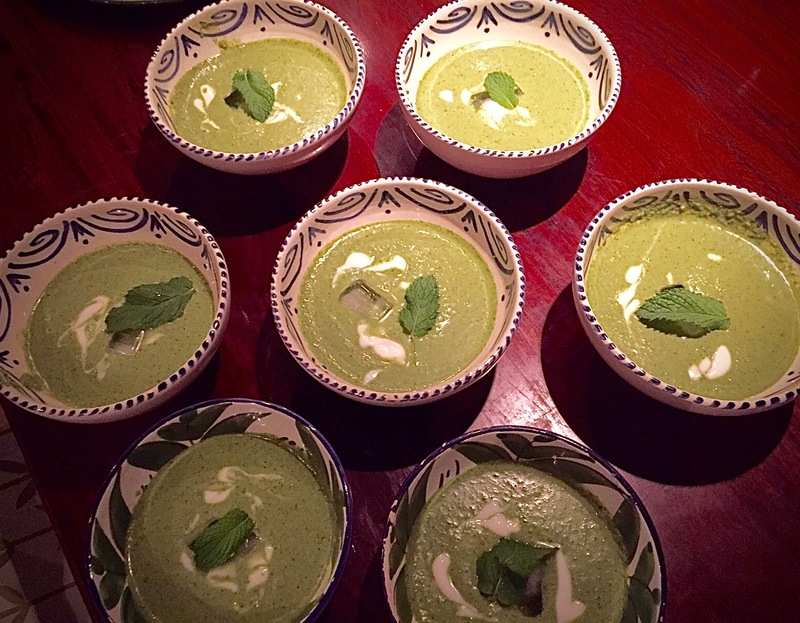 Ottolenghi’s Green Gazpacho, in which nearly every fresh ingredient came from the Parkers’ garden. Photo credit: Honour Schram de Jong. 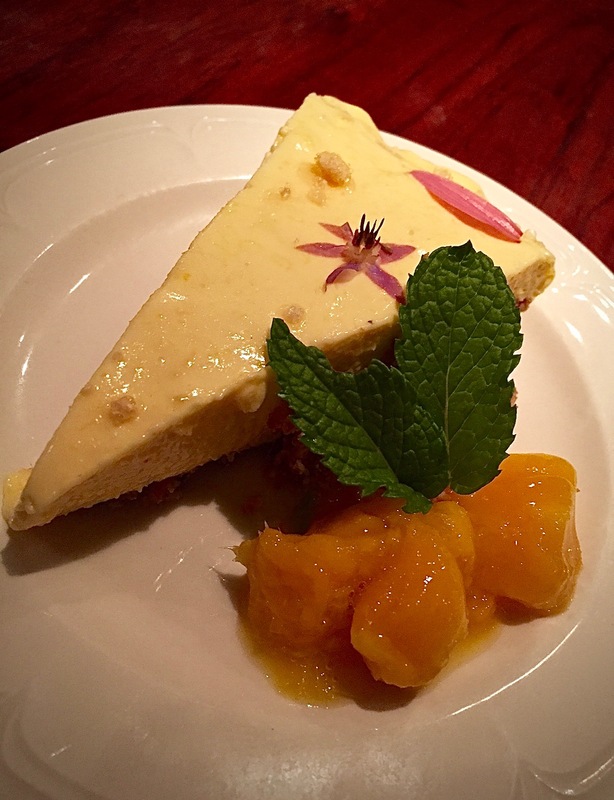 Gluten-free Mango Cheesecake, garnished and presented by Vanessa & Honour. Photo credit: Vanessa Parker. If you are interested in booking a cooking class, demonstration, or lunch, please contact me via the SavannaBel contact form above, or through my SavannaBel Facebook page. Please state what exactly you’re interested in, the number of attendees, and where you would like me to hold the class. This current introductory class, which is now almost fully booked, is only available through November because December and January are taken up with other events and activities. My classes will resume through 2016, starting on February 1. 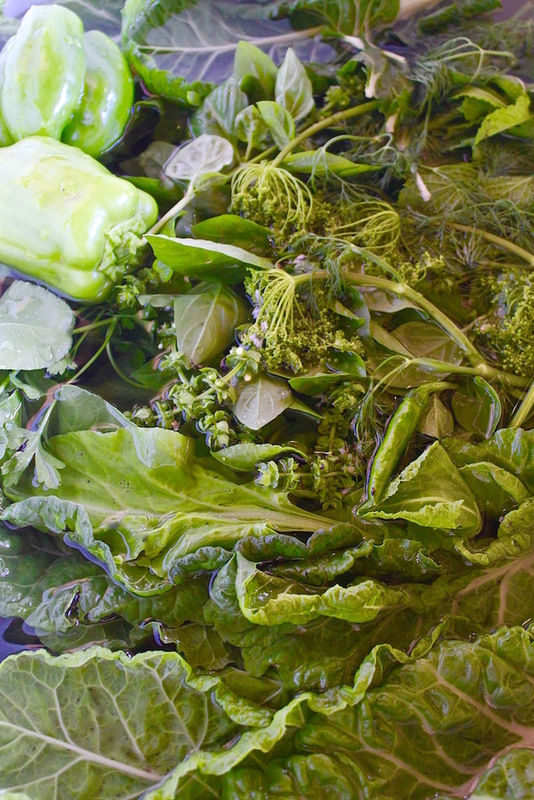 Nice Posting looked like a fun day pic of ingredients look fab also like the new header. Lovely to hear from you again, Mike! Thank you for stopping by the blog. It was a FUN day … and it’s a joy to teach about that which you are passionate. Thank you so much, dendymactoodle! I would love to take your class! If only I could commute from Virginia! Thank you, chef mimi! You are welcome whenever you plan your trip. If it’s any consolation, I bumped into many more snakes living in Virginia than I ever have here … so please don’t worry yourself anymore! I do hope the recipe for that delicious looking gluten free mango cheese cake is going to appear in future posts. Our mangos will be ripe in a few weeks and I’m getting tired of making atjar! All the best with the cooking classes.